There’s an ongoing battle in the gaming laptop space to create the thinnest, most impressive and aesthetically pleasing devices. 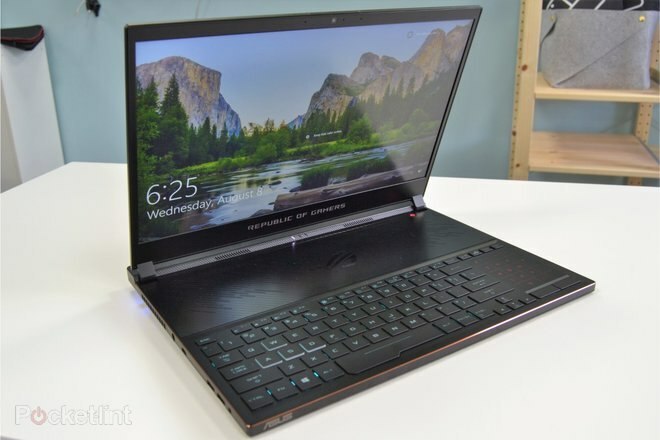 A series of ultrabook-styled laptops have appeared from the likes of MSI, Razer and more. 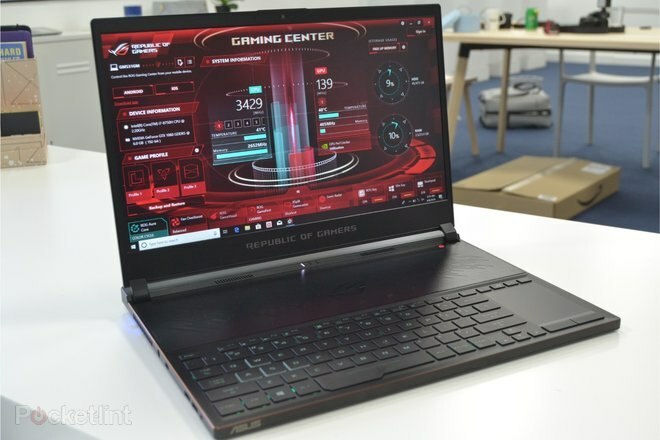 The Asus ROG Zephyrus S GX531 is the latest contender in this battle, which Asus claims is the world’s thinnest gaming laptop. It’s also packing some of the latest tech under the hood and the company promises the design doesn’t compromise performance. We’ve had some hands-on time with the pre-release version of this gaming laptop to bring you our initial thoughts. If looks alone are anything to go by, it’s going to be a real pleaser. The Asus ROG Zephyrus S GX531, as you can tell from the specs, is a premium gaming product designed to deliver excellent gaming performance. As far as specs go, there will be different configurations available with a choice of GPU, storage and memory options depending on your preference. But it’s much more than that too: it is Utrabook-style and wouldn’t look out of place in the office or on the train, yet will still allow you to crush your enemies in the evening with a gaming session on PUBG or Fortnite. Under the ROG’s hood is enough power to handle demanding work like compiling, video rendering and content creation, gaming, or simply smashing through your daily spreadsheets and PowerPoint presentations. This machine is not just good to look at, it’s also flexible too. At a mere 14.95mm thick (that’s thin for a gaming laptop), with a 14.2-inch chassis, this new laptop weighs just 2.1kg – so it’s easy to throw in a bag and take with you anywhere you need to go. The results are pretty impressive. With ultra-thin bezels, Asus has managed to cram a 15.6-inch 1080p IPS panel into a compact chassis. This screen also boasts a 144Hz refresh rate and 3ms response time, so it’s theoretically more than capable for its task. The thin bezels manage to give the impression of a larger screen, but on a smaller laptop. As well as an impressive screen, the Zephyrus S features dual front-facing speakers with smart-amplifier technology and virtual surround-sound capabilities. If you’re not one for blasting your tunes or gaming sounds out loud then there’s a 3.5mm headphone jack and a multitude of USB ports for your favourite gaming headset. There are USB-C ports on both left and right sides as well as standard-size USB ports too. These should be more than enough for standard use – though we did note there aren’t enough standard USB ports for using with an Oculus Rift. The USB-C ports are DVI capable though, meaning you can hook-up an external screen with ease as long (so you have the right cable). Indeed, with an HDMI output on the rear, it’s possible to attach this laptop to two external monitors and theoretically more! Performance improvements within processor tech and software management means you can get around four to five hours out of the battery before it needs recharging under usual use. For gaming, it’s more like two hours as standard, or more available if Nvidia BatteryBoost is enabled. Wi-Fi capabilities should be strong too. With 802.11ac Wave 2 Wi-Fi and two antennae, the Zephyrus S is meant to manage a better and stronger signal whatever you’re doing. Essential for game downloads and steady play sessions. 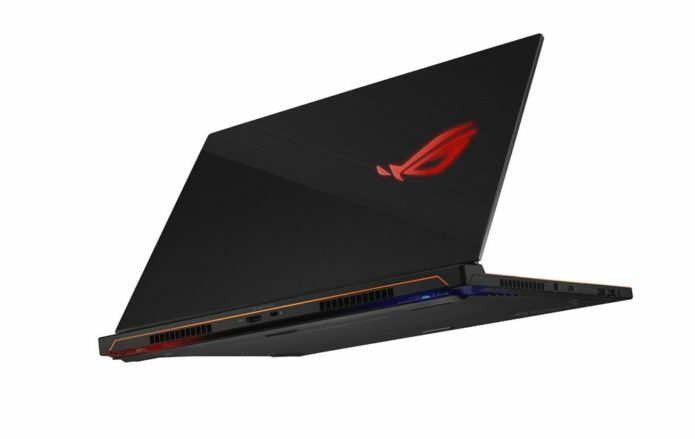 With the ROG Zephyrus S GX531, Asus set out to build the thinnest gaming laptop on the market. It also wanted to create a premium product without cutting corners. From the ground up, this laptop is crafted with premium build in mind, hence the additional price premium. The chassis of this laptop is CNC milled in a process that takes over an hour for each laptop alone. This device isn’t made from a slab of metal that’s pressed by a machine, instead it’s lovingly crafted to be much more lightweight and robust. The machine is put through military-grade durability testing to ensure it can stand up to the everyday hustle and bustle. The Asus ROG Zephyrus S GX531 boasts some other pretty clever design features. One example is the Active Aerodynamic System: this air venting works when you open the screen to avoid any area of the laptop’s underside getting too hot when it’s sat on your lap or desk. 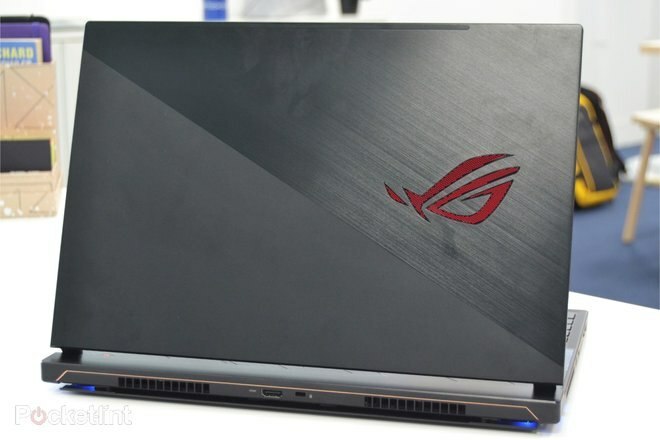 This venting stretches across the entire back of the laptop and Asus claims it helps improve airflow by as much as 22 per cent compared with classic laptop designs. Inside the GX531 there are five heat pipes to pull heat away from the CPU and GPU, plus four heatsinks and two AeroAccelerator fans (each with a whopping 83 blades; for those who are counting that’s 17 per cent more blades than in the previous model). All this means superior cooling to keep noise down and performance up. Air intake fans on the top of the device drive cooling air into the machine when it’s in use. This design means the keyboard is pushed closer to the front edge. The keyboard-forward layout of the Zephyrus S is interesting. We got to play with it a bit during our hands-on session and found the keyboard key presses to be comfortable and easy to use, however, we do wonder what it will be like to use this style every day. This design means there’s nowhere to rest your wrists like there is on a traditional laptop. Asus acknowledged as much with the previous model by including a palm rest as an optional accessory. There’s no official word on whether the company will do the same here too. Despite this, the design certainly still looks promising. The keyboard includes Overstroke technology for improved responsiveness, N-key rollover and 1.2mm of travel for a comfortable typing feel. RGB backlighting on the keys that can be turned on/off and adjust using function keys built into the directional buttons. The machine also features lighting on the sides that can be customised and features Aura Sync capabilities – meaning it can be paired with Asus peripherals. We found the lighting to be subtle; the idea is to have an ultra-book styled laptop that can be used for work or on the train without being embarrassingly obvious. You’ll also note that the trackpad isn’t in the usual place either, but instead sits on the right-hand edge. This is actually a design feature we like a lot as its placement makes it more like a normal mouse position and it gets in the way less when you’re typing… although it’ll take some getting used to for many, we’re sure. The trackpad also doubles as a touchscreen numpad. A simple button press backlights this part of the keyboard and allows you to punch in numbers when you need to. Another feature we feel is pretty handy, especially when switching from gaming mode to everyday office use. 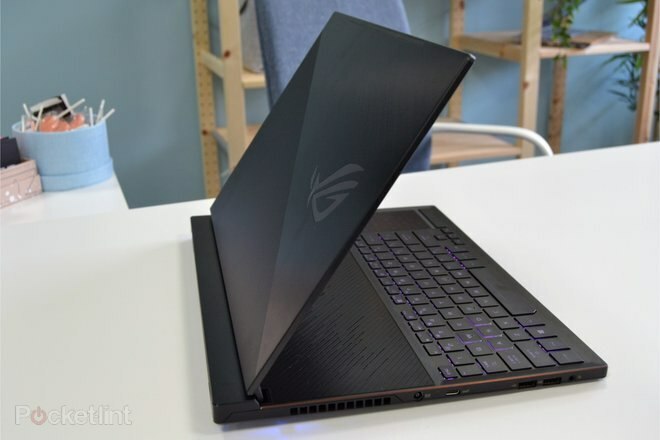 The Zephyrus S GX531 is the pinnacle of the Asus ROG laptop line-up. 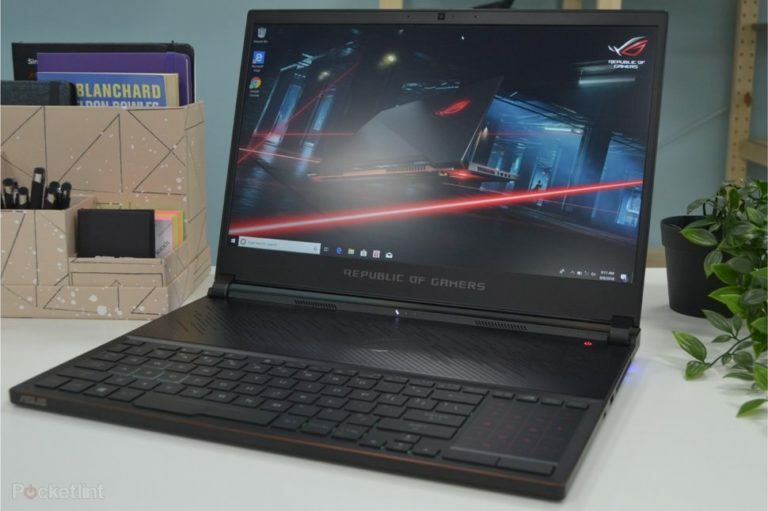 It’s not necessarily the best gaming laptop ever – some compromises will have been made, after all, to claim the title of “thinnest” – but it’s an excellent balance of features, specs and design aesthetics. If you’re after something with Ultrabook-styling that’s good enough to run the latest games when you’ve finished presenting your daily PowerPoint presentations, then this may well be at. No more being laughed at by colleagues for your over-the-top gaming laptop either, as the Zephyrus S is as good-looking as it is capable. This premium design does come at a cost though, with prices starting at a penny shy of £2K, then increasing depending on your spec choices. From what we’ve seen, however, we’re fairly certain it’ll be worth every penny to the right users.